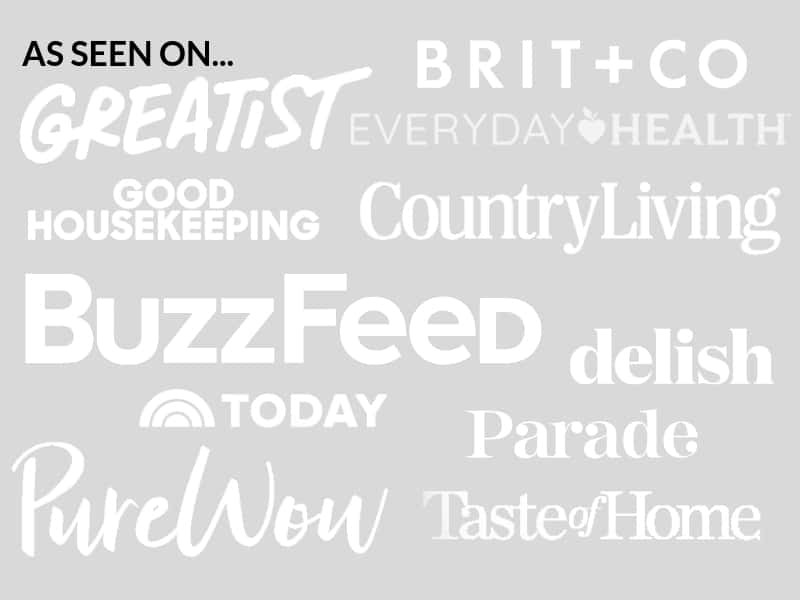 April 24, 2018 By Elizabeth Lindemann Leave a Comment / This post may contain affiliate links. I am a strong believer in simple guacamole being the best guacamole. 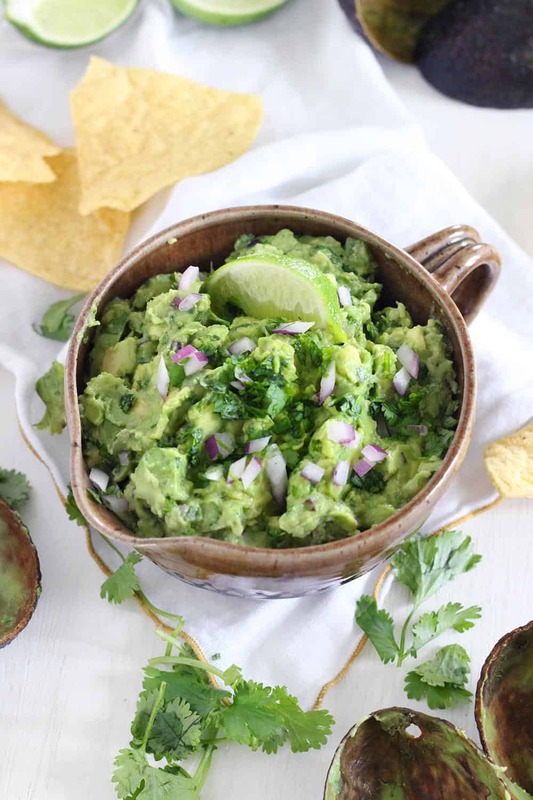 This recipe is about as simple as it gets- nothing but avocados, cilantro, lime juice, salt, and a little bit of red onion for color, flavor, and crunchy texture. 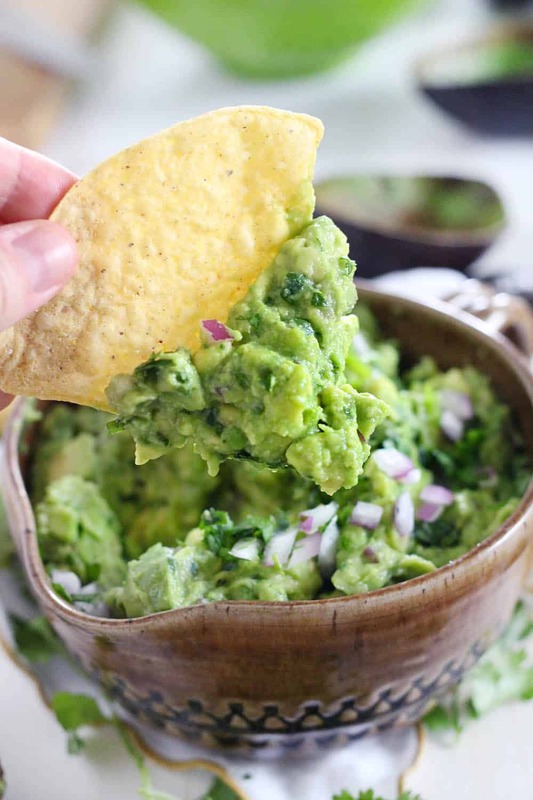 The avocados are diced rather than mashed for the ideal chunky, cling-to-every-chip texture. There are no tomatoes to water it down, and no added spices to take away from the simplicity… just delicious, simple guacamole. Not that I’m judging you if you add tomatoes or cumin to your guac. You do you. I just love how the texture and flavor of the avocado shines in a simple guacamole recipe. The texture in this guacamole is perhaps my favorite part. It’s achieved by dicing the avocados and then simply stirring them with the other ingredients, rather than mashing them. I always dice avocados in the peel after halving them and removing the pit. Then, I use a spoon to scoop out the diced flesh into the bowl. After adding the avocado, cilantro, lime juice, and red onion, I just stir it with a spoon for a while until it’s reached the desired consistency. The avocado is so soft that it will naturally mash up a bit this way, while at the same time leaving some deliciously chunky parts. The more you stir, the more mashed up the avocado will be. I always make a LOT of guacamole at once- the recipe below makes about six servings. The leftovers are delicious spread on sandwiches throughout the week, or as a quick snack with tortilla chips. But avocados do have a tendency to go brown, similarly to apples or bananas, when exposed to the air for too long. To prevent the guacamole from browning, I do two things. First, I squeeze a bit of lime juice on the surface of the guacamole. The acidity in the lime juice will help prevent browning. Then, I press a piece of plastic wrap directly on the surface to cover it, rather than stretched across the top of the bowl. Exposure to air (specifically, oxygen) causes the browning, so if you prevent air from touching it, it won’t brown. I usually make a batch of this when I’m entertaining a lot of people- it’s fresh and delicious and easy to put together and serve with store-bought tortilla chips. I also love spreading it on breakfast sandwiches or toast, topping fish, eggs, or chicken with it, or using it in tacos or burritos. It’s super versatile, as well as low-carb, vegan, and paleo/whole30 compliant. 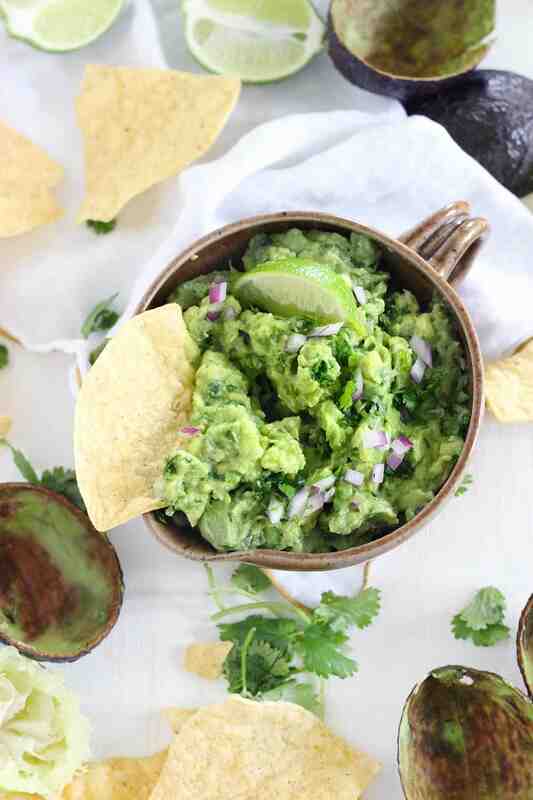 Here’s the printable recipe for the best simple guacamole! 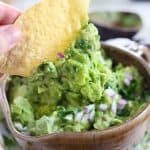 This simple guacamole recipe is truly the best- nothing but avocado, cilantro, lime juice, salt, and a little bit of red onion. The avocado is diced rather than mashed for the ideal chunky texture. Eat it with tortilla chips, on toast, on tacos or burritos, top eggs or fish or chicken with it, or eat with a spoon directly from the bowl! Halve avocados and remove pits. Using a paring knife, dice the avocado while it is still in the peel by cutting the flesh in both directions into approximately 1/2 inch squares. Scoop out the diced avocados from the peel with a spoon and place in a bowl with remaining ingredients. Stir using a spoon until desired consistency is reached (the avocado will mash a bit, especially if you stir vigorously, but you still want some chunky texture). Serve with chips, on tacos or burritos, on top of chicken or fish, or on eggs, or anything else you love to eat with guacamole! To save leftovers from browning: First, squeeze a bit of lime juice on the surface of the guacamole. The acidity in the lime juice will help prevent browning. Then, press a piece of plastic wrap directly on the surface to cover it, rather than stretched across the top of the bowl, since exposure to air causes browning.